after relatively stagnant performance in the previous phase. These are the “micro” behind why a bubble emerges in the final phase. Today we want to look at the intermarket driving forces behind the emergence of a bubble. Presently, Gold is struggling to find demand as Bonds and the S&P 500 remain in bull markets. However, we believe the cyclical bull market in equities will soon come to an end and that the secular bull market in Bonds could form a major peak in the next 12-18 months. Gold and hard assets have been in a bull market for nearly 13 years. Barry Bannister’s research shows that bull markets tend to average 16-18 years. 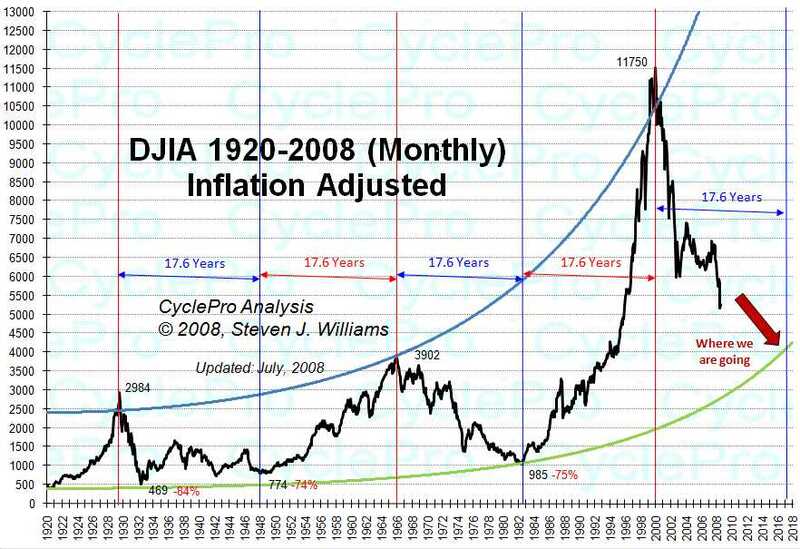 Steven J Williams at Cycle Pro shows that adjusted for inflation, each equities cycle is about 17 and a half years. The present bull market could very well end in 2017 or 2018. This is at the most, six years away. Related Tickers: SPDR Gold Trust (NYSEARCA:GLD), Market Vectors Gold Miners ETF (NYSEARCA:GDX), iShares Gold Trust (NYSEARCA:IAU), Market Vectors Junior Gold Miners ETF (NYSEARCA:GDXJ), Goldcorp Inc. (NYSE:GG), Barrick Gold Corporation (NYSE:ABX), Kinross Gold (NYSE:KGC), IAM Gold (NYSE:IAG). Jordan Roy-Byrne, CMT (AKA, “Trendsman”) is the proprietor of Trendsman Research, which provides investment research to private clients and the general public. Trendsman Research authors several newsletters covering trends in stock markets, bonds, commodities, gold, and silver. Mr. Roy-Byrne, a Chartered Market Technician and member of the Market Technicals Association, is also an official contributor for the CME Group. He is particularly skilled at extracting emerging fundamental themes from his technical research. He is also the host of The Financial Tube and the editor of The Daily Gold and its premium newsletter. Mr. Roy-Byrne attended the University of Washington.